Half the disease burden of the developing world – 80% of the world’s population – is due to infectious and parasitic diseases, most of which are preventable and/or treatable. More than 1 billion people is affected by at least one neglected tropical diseases (NTDs), primarily poor populations living in tropical and subtropical climates, with an approximated 534 000 deaths per year. These diseases have a huge impact on labor productivity and costs low-income countries billion of dollars a year, keeping up the vicious circle of poverty. Yet despite these alarming numbers, between 1975 and 1999 only thirteen new drugs were approved that targeted NTDs. Fortunately, over the past decade the tide has began to turn, in both recognizing the lack of new medicines dedicated to the diseases of the most neglected populations and in initiating efforts to redress the problem. In recent years, there has been a remarkable commitment on the part of ministries of health in endemic countries, global health initiatives, funding agencies and philanthropists escalated, as did donations of medicines from pharmaceutical companies and the engagement of the scientific community, having efforts towards the infectious diseases of the developing world. In this scenario, medicinal and synthetic chemists are of upmost importance, for designing, synthetizing and evaluating new drug candidates for parasitic and infectious diseases. 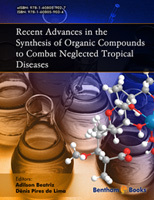 This eBook is dedicated to the theme of “Recent Advances in the Synthesis of Organic Compounds to Combat Neglected Tropical Diseases” and features contributions from a Brazilian team of synthetic chemists and pharmaceutical researchers that work in the field of synthesis of compounds that are potentially bioactive against the causative agents of NTDs. In the website of WHO, 14 diseases are reported to occur exclusively or specially in tropics. Most of them are infectious diseases affecting mainly poor populations and include leishmaniosis, dengue fever, malaria and Chagas disease. These diseases affect around 1 billion people and, according to WHO, 100% of developing countries are affected by at least five of these diseases. Accordingly, there is an urgent necessity for increasing the arsenal of drugs to combat neglected diseases in order to guarantee relief and well-being to many patients. The situation requires powerful research and improvement of politics to support investigation in this area of knowledge. There is a great volume of scientific work dealing with biology, immunology and genetics of parasites which cause these diseases. Taking in account the present situation, the role of Organic Chemistry in the pharmaceutical industry continues to be one of the main propellers for the discovery of new drugs. Medicinal organic chemists have contributed by seeking new bioactive compounds. Nowadays, there is a considerable global effort to evoke awareness to this problem and overcome the persisting inequality in the focus of drug discovery. Therefore, this eBook gathers important scientific research performed by scientists worldwide showing the state of the art of Organic Medicinal Chemistry dedicated to the synthesis of compounds that are potentially bioactive against the causative agents of neglected diseases. The eBook intends to be a valuable source of information to researchers in the area of Medicinal Chemistry, Organic Synthesis, as well as to undergraduate and graduate students interested in this subject. The eBook is composed of eight chapters, each of which is dedicated to one type of neglected disease. Essentially, the authors compiled important work concerning the synthesis and biological evaluation, according to their targets, of lead compounds in the process of developing new pharmaceuticals. Federal Institute of Mato Grosso do Sul.